Save money and skip the hassle of traffic. 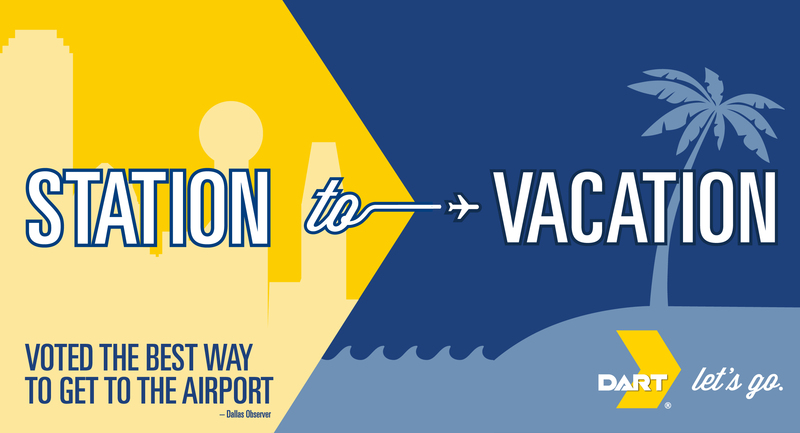 DART has convenient and economical ways to travel to both Love Field and DFW Airport. Download the GoPass app for mobile tickets, schedules, travel tips, and more. DART’s Love Link 524 operates between Dallas Love Field and Inwood/Love Field Station, providing an airport connection to the DART Rail Green Line and Orange Line. The Green Line and Orange Line provide service to downtown Dallas. Transfer to the Red Line or Blue Line at any one of these four downtown stations – West End, Akard, St. Paul or Pearl/Arts District. Victory Station on the Green Line and Orange Line provides a connection between DART Rail and the Trinity Railway Express (TRE) commuter rail. DFW Airport Station provides convenient access to DFW International Airport’s Terminal A. A scenic walkway connects the station to the terminal (Terminal A, Lower Level Curb, Entry A-10). DFW Airport Station is served by DART Rail Orange Line trains.